On March 3, 1927, the Board of Diocesan Seminary Trustees accepted an offer from Don Juan Camarillo (1867-1936) of 100 acres high on an expansive terrace of the Ranchos Calleguas and Las Posas in Ventura County. According to the intentions of the donor, the land was to be used as a site for a seminary to be named in honor of St. John the Evangelist. The site is surrounded by orange and lemon groves and is, itself, comprised of rare, beautiful landscaping which overlooks a wide panorama of fertile coastal plains, with long highways stretching between orchards and cultivated fields. The Most Reverend John J. Cantwell, D.D., Archbishop of Los Angeles, after announcing a successful, concerted campaign for funds on January 14, 1938, proposed the building of St. John’s Seminary. In August of that same year, ground was broken. The following year, on March 19, 1939, the cornerstone was inserted in the already erected building. Archbishop Cantwell entrusted the administration of the seminary to the Vincentian Fathers. On September 12, 1939, under the leadership of its first Rector, Reverend William P. Barr, C.M., and ten faculty members, St. John’s Seminary opened its doors to seventy candidates for the priesthood. The development of the grounds expanded swiftly. The chapel was solemnly consecrated by Archbishop Cantwell on October 8, 1939, although artistic additions continued to be made during ensuing years. On October 14, 1940, the Apostolic Delegate dedicated the Edward L. Doheny Memorial Library. By May, 1941, the episcopal residence had been completed and almost a year later, in April 1942 the seminary swimming pool was opened. After the death of Archbishop Cantwell on October 30, 1947, James Francis McIntyre became the second Archbishop of Los Angeles. Shortly thereafter, Reverend Francis Koeper, C.M., was named Rector of St. John’s Seminary and served from 1948 to 1954. During this administration, St. John’s Seminary received its first accreditation from the Western College Association in 1951. Reverend James Richardson, C.M., succeeded Father Koeper as Rector in 1954. Between 1954 and 1958 Cardinal Mc- Intyre realized the long-planned expan- sion of the seminary. In 1956 the Cardinal dedicated a new dormitory-classroom- recreation building immediately behind the original complex. The addition increased the number of classrooms from five to seven and the number of student rooms from 104 to 180. Reverend William Kenneally, C.M., Rector from 1958 until 1967, supervised the construction of St. John’s Seminary College, which was completed in 1965 on the crest of the hill above the theologate. The new St. John’s Seminary College housed three dormitories, an administration building, refectory, auditorium, the Carrie Estelle Doheny Memorial Library, and the St. James Chapel. With the opening of the College came the termination of the program of six years at the junior seminary and six years at the major seminary. The system was regularized into the more common four year segments: high school, college, and graduate school, with each institution situated at a separate location. 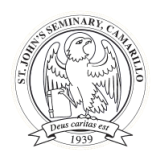 St. John’s Seminary now devoted its entire program to graduate level theological education and was empowered to grant a Master of Arts degree. It was during the 1968 to 1973 administration of Reverend John Danagher, C.M., that St. John’s worked to respond to the Second Vatican’s Council’s new ideals for priestly formation. In light of these ideals, deacons were introduced to pastoral ministry by working in parishes on weekends, while all other students participated in supervised learning experiences in the field, including catechetics, social work, hospital ministry, adult education, vocational promotion and youth retreats. Academic standards were improved by affiliation with the American Association of Theological Schools. In the year of his 50th anniversary of priestly ordination, 1970, Cardinal McIntyre retired from the administration of the Archdiocese. He was succeeded by his coadjutor, Archbishop Timothy Manning, who had assisted Archbishop Cantwell as secretary and auxiliary and Cardinal McIntyre as vicar-general and chancellor. Pope Paul VI honored him in 1973 with promotion to the cardinalate. From 1973 to 1978, under the leadership of Reverend John Grindel, C.M., the seminary renewed its accreditation with the Western Association of Schools and Colleges (WASC) and was given its initial accreditation in 1976 from the Association of Theological Schools in the United States and Canada (ATS). In 1981 both agencies reaffirmed accreditation for ten years, the maximum term accorded. During the administration of Reverend Charles Miller, C.M., 1978-1987, the seminary modified its overall program in the interest of enriched spiritual, pastoral and academic training. In 1979 St. John’s developed its Pre-Candidacy Program, for college graduates with no previous seminary experience. In 1982 two new elements were developed. The first was a six-week Intensive Period of Spiritual Formation (IPSF) for first year seminarians, and, the second, a six-month parish internship in home dioceses prior to diaconate ordination. Continued evaluation of these programs has resulted in some modifications in schedule and location. Reverend Monsignor (now Archbishop) George Niederauer, the first Archdiocesan priest and the first alumnus to serve as Rector of St. John’s Seminary, served from June 1987 through June 1992. The seminary experimented briefly with a small six-week summer school session in July of 1989. St. John’s also experimented with a January interim, while; at the same time, it updated the pastoral Spanish program by integrating new language requirements into the curriculum. From 1990-1992 Monsignor Niederauer led St. John’s Seminary through its re-accreditation process. When Reverend Monsignor Gabino Zavala, J.C.L., began his term as Rector on July 1, 1992, the seminary had just received a nine year re-accreditation from its accrediting agencies, ATS and WASC. Monsignor Zavala’s term as Rector was interrupted when he was ordained an Auxiliary Bishop of Los Angeles on March 19, 1994. Reverend Monsignor Jeremiah J. Mccarthy, Ph.D., who had been serving as Vice-Rector and Academic Dean, was named Rector/President on May 31, 1994. Under Monsignor McCarthy’s direction, St. John’s undertook a revision of its formation tasks and administrative policies in a coordinated effort to position itself to continue as an effective and high quality institution into the twenty-first century. Monsignor McCarthy strengthened the seminary’s formational focus by creating the position of Director of Formation and Evaluations. Also, under Monsignor McCarthy’s leadership, the seminary embarked on “Project 21” which strengthened the academic formation of the seminary with a number of new initiatives including the integration of twenty-first century information technology into the entire campus. Reverend Monsignor Helmut A. Hefner, J.C.L. began his term as Rector/ President of St. John’s Seminary in June 2001. Under the direction of Monsignor Helmut, the seminary received a renewal of accreditation in June 2002 from the Association of Theological Schools (ATS) and the Western Association of Schools and Colleges (WASC) for the maximum term accorded. As part of the seminary’s ongoing effort to enhance its overall program of formation, the then Joint Board of Directors under the direction of Msgr. Hefner initiated a strategic plan in 2001. As a means of providing formation opportunities for lay ecclesial ministers, the seminary began the Master of Arts in Pastoral Ministry (MAPM) Program in May 2003. The MAPM and the MA degrees are offered for qualified lay ministry students. In 2003, St. John’s Seminary College was closed due to a declining enrollment. The seminary assumed responsibility for the remaining college seminarians and supplied the necessary academic and formational program for them to complete their courses of study. The “teach out” was completed successfully in May 2005. On July 1, 2007, Reverend Monsignor Craig A. Cox, J.C.D., D. Min., was appointed by Cardinal Roger Mahony as the seminary’s twelfth Rector/President. Since his arrival, Msgr. Cox has seen to the completion of the remodeling of two dormitories and oversaw the beginning of the remodeling of Joseph Dorm. Other improvements include provisions for handicap access to seminary buildings and upgrades to the seminary infrastructure in the facilities and grounds. The Office of Institutional Advancement was established in 2007 to enhance the seminary’s community relations, fundraising, and alumni programs. The Distinguished Alumni Award’s Dinner was begun in 2008 to acknowledge the significant contributions of our alumni, both clergy and lay, to the life of the Church. On March 1, 2011, Archbishop José H. Gomez assumed leadership of the Archdiocese of Los Angeles. He has made the program of priestly formation at St. John’s Seminary a top priority of his ministry along with recruitment of vocations for priestly ministry. On January 14, 2014, Archbishop Gomez announced the appointment of Msgr. Marc V. Trudeau as Rector/President of St. John’s Seminary at the conclusion of the term of Msgr. Craig Cox on June 30. St. John’s is celebrating the 75th anniversary of its founding during the school year 2014-2015.